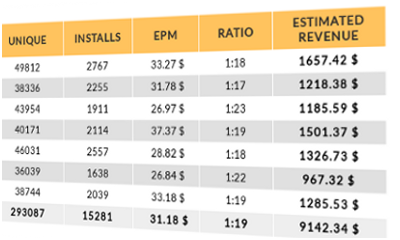 Install rates are flexible (Rev Share) and depend on installation of offers bundled with their installer. NetCashRevenue priority is to keep a high prices of installs and optimize the installation process in order to maximize the profits of their affiliates. NCR pay attention to keep the installation ratio very high by using clean, not blacklisted domains and user friendly installation process. For this reason publisher earnings per 1000 unique visitors can be higher than in other networks. In their network almost each exe download ends with paid installation. For landing pages a typical installation ratio fluctuates between 1:9 and 1:20 depending on traffic quality. It means up to 110 installations from 1000 unique visitors redirected from affiliate to their landing page. They always pay on time by wire transfer, PayPal, Western Union and Bitcoin. Payment period is NET45.